Death Valley is unique in its size, geology, and age. The park is nearly 3.4 million acres (the largest park in the lower 48); it features colorful mountains, badlands, sand flats (and dunes), and the lowest point in North America (in Badwater Basin, at 282 feet below sea level)… and the valley itself is a graben caused by fault lines; and its populated with resorts and towns (ghost and active) because it only became a national park in 1994 (though it had been a national monument since 1933); it has a history of mining, salt mining (borax), and tourism because of natural springs. 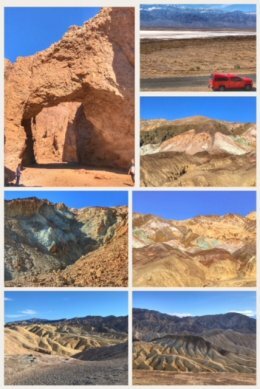 Our second day (shown in the pictures to the left) included checking out the Ashford Mill ruins ( a former mining settlement), hiking up to Natural Bridge (carved by ancient floods), driving Artists Palette Drive (a 9-mile one-way road that offers views of colorful rock formations caused by the oxidation of different metals, including blues, yellows, greens, pinks, purples), and concluding with a hike up to Zabriskie Point (with amazing views of badlands). 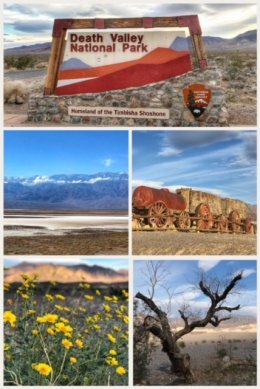 Given its size, we could have spent several more days in the park, but the road was calling us to move on… and after a quick layover in Mojave, CA, to recharge and get work done, we are back on the road to Three Rivers, CA, and our next national park adventures!